To make it easier for users of your VBA systems to choose files, you can show FileDialogs on screen. This blog explains what these are, and how to customise them. This blog is part of a complete Excel VBA tutorial. Have a look also at our VBA training courses. There are actually really only 2 choices. 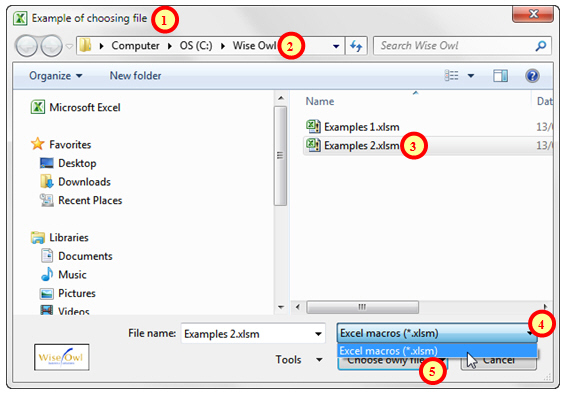 The first, third and fourth options above all display a dialog box for choosing a file; the second displays a dialog box for choosing a folder. 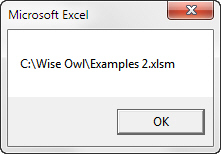 In particular, note that just because you're using an msoFileDialogOpen dialog box, for example, doesn't mean that Excel will then open any file you pick (it's still up to you to do that in code). The first element of the SelectedItems array shows the name of the one and only file chosen. Notice how VBA inconsistently denotes the first item in the array of selected files with the number 1, not 0. A prettified file dialog box! fd.Title = "Example of choosing file"
fd.ButtonName = "Choose &owly file"
The button name won't appear - oddly - until you've clicked on a file first. fd.ButtonName = "Choose this file"
Notice that although here we used the msoFileDialogOpen dialog type to choose a workbook, this didn't automatically open it! That's most of the story on FileDialogs - in the final part of this blog, we'll consider how to work with multiple files.